Shek O located on the D’Aguilar Peninsula on the south-east corner of Hong Kong Island is regarded as having the best beach on the island. With clean fine golden sands in a scenic location sheltered by a rocky headland the beach is popular with surfers and the tip of the headland is a popular venue for rock climbing. The beach overlooks a small island Ng Fan Chau in Island Bay and there are beachside café’s, changing rooms, showers, toilets, raft playground, BBQ area and crazy golf course. A lifeguard service operates from April to October and there are shark prevention nets. 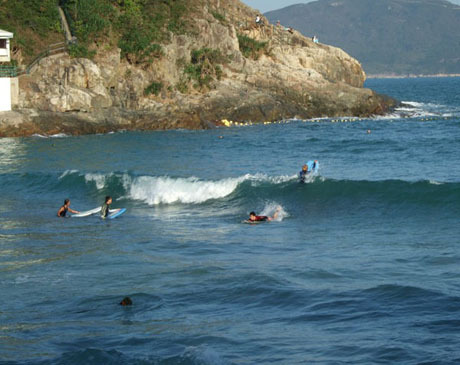 Shek O also has a smaller beach Rocky Bay (no facilities and swimming not allowed) on the other side of the headland and is also a short distance from neighbouring Big Wave Bay, Hong Kong’s only officially designated surfing beach (see below). GETTING THERE – MTR Island Line to Shau Kei Wan Station exit A3 then from nearby Shau Kei Wan Bus Terminus take number 9 bus (approx every 15/20 mins) to Shek O (journey time about 30 mins). 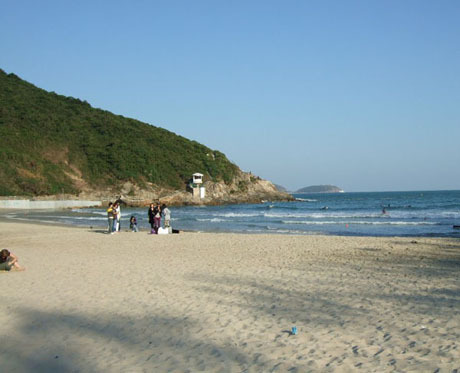 Often living up to its name, Big Wave Bay has a good beach with clean sands and is a popular surfing beach. 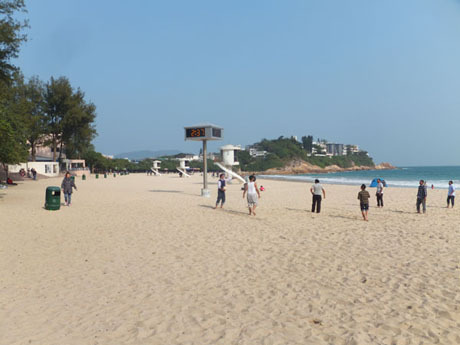 Separated from its neighbouring Shek O beach (see above) by the exclusive Shek O Golf and Country Club the beach is in a scenic location overlooked by the hills of Shek O Country Park and the Dragon’s Back hiking trail. The beach has a café, showers, toilets, changing rooms and BBQ area. Lifeguard service operates from March to November and the beach has shark prevention nets. GETTING THERE – MTR Island Line to Shau Kei Wan Station exit A3 then from nearby Shau Kei Wan Bus Terminus take number 9 bus* (approx every 15/20 mins) for Shek O. Get off at the junction of Shek O Road with Big Wave Bay Road (at a sharp U-turn) from where it is about 10 minutes walk to Big Wave Bay Village and beach. To walk between Shek O and Big Wave Bay takes about 30/40 minutes. As an alternative visitors can take number 9 bus either to the junction of Shek O Road and Big Wave Bay Road or to Big Wave Bay Village (if bus is diverted via Big Wave Bay Village – see above). To benefit from the sectional fare for this journey Octopus Card users need to “swipe” the card on the card reader when leaving the bus as well as when boarding. 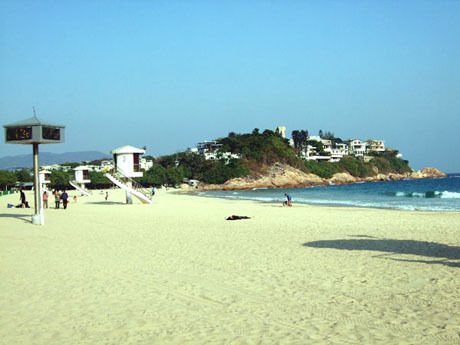 Hong Kong’s most popular beach is one of Hong Kong’s top ten tourist destinations. 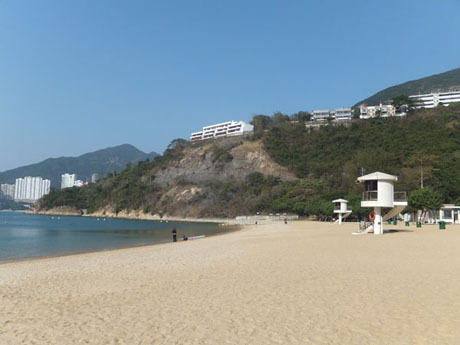 Repulse Bay is one of Hong Kong's most accessible beaches, becoming very busy during the summer months and winter weekends, and being a popular destination on the coach tour circuit. It is located on the south side of Hong Kong Island and easily reached several bus routes. The bay was once a haven for pirates intent on plundering foreign merchant ships trading with China until being repulsed by the British fleet in 1841 which is how the bay achieved its name. 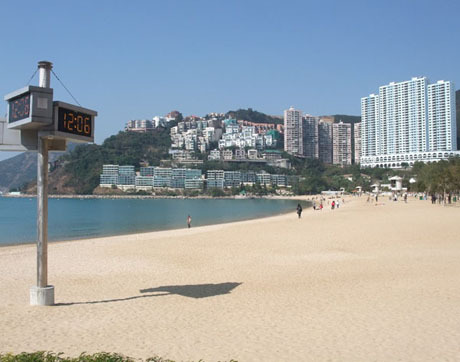 Repulse Bay beach is a long artificial beach with mainly coarse sand but areas of fine sand nearer the shore. 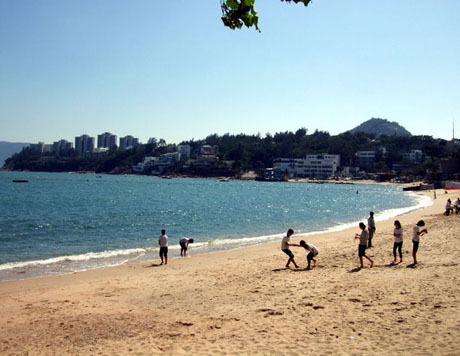 The beach is overlooked by high-class residential apartments and the hills of Tai Tam Country Park and has excellent facilities including changing rooms, showers, toilets, raft, playground, beach volleyball court and cafés, restaurants and gardens. 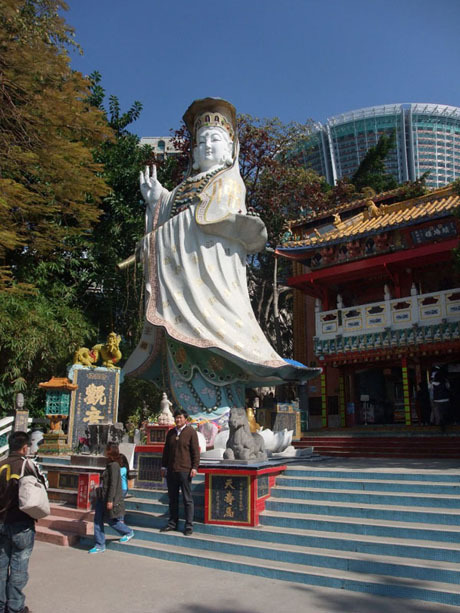 At the eastern end of the beach is the Tin Hau Temple, Kwun Yam Shrine and numerous garish statues including those representing Kwun Yam and Tin Hau. Here visitors toss coins into the mouth of a fish statue in the hope it will lead to good fortune. There is also a pier and bridge. A newly completed shopping mall, The Pulse, stands alongside the beach near the temple, but as at February 2012 remains closed owing to a protracted legal dispute with the Government's Lands Department regarding planning consent. Across the main road The Repulse Bay is built on the site of the former colonial Repulse Bay Hotel and is renowned for being the “building with the hole in the middle” designed by a feng shui expert. It houses luxury apartments and a shopping arcade. The shopping arcade has been renovated and includes an exhibition of artefacts, rare photographs, postcards and menus from the 1920's providing an illustration of the lives of the privileged in old Hong Kong. The renovation also included addition of a spa and an English-style marquee in the garden which has also been refurbished. The landmark Seaview Building at 16 Beach Road is also to be renovated and refurbished and the government has invited ideas for the design and future use and proposals include plans for a classic car museum. A beautification programme was undertaken by the government during 2009 to enhance the appearance of the area for visitors. In November 2015 a new beachside shopping mall and dining venue "The Pulse" opened on the site of the former Lido Shopping Mall and includes a 3D museum, "Repulse Bay Visual Art Museum"*. Lifeguard service operates from March to November and there are shark prevention nets. GETTING THERE – Bus 6,6A,6X or 260 from Central Exchange Square (about 35 mins journey). Bus 66 from Central Exchange Square (Mon-Fri peak hours only. Bus 973 from Tsim Sha Tsui East Bus Station (Science Museum Road inside Concordia Plaza – about 70 mins journey). Bus 63 (Mon-Sat) or Bus 65 (Sundays and public holidays) from North Point Ferry Piers and Causeway Bay (about 35 mins journey). 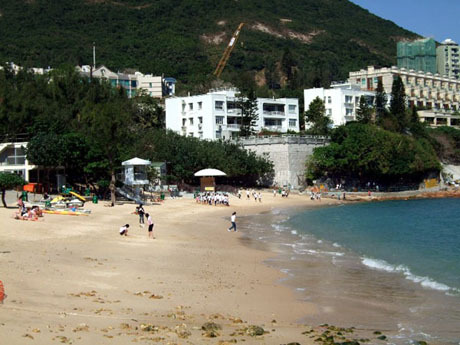 This is a very popular beach close to Repulse Bay with good sands overlooked by trees and just over the road from Hong Kong Golf Club. The main road running alongside means this is by no means a quiet but it is quite scenic and sheltered. The beach is a popular venue for wakeboarding and facilities include changing rooms, showers, toilets, raft, BBQ area, refreshment kiosk and nearby café’s and restaurants. Lifeguard service operates all year round and the beach has shark prevention nets. GETTING THERE – Bus 6X or 260 from Central Exchange Square (about 30 mins journey). Bus 973 from Tsim Sha Tsui East Bus Station (Science Museum Road inside Concordia Plaza – about 70 mins journey). Bus 65 (Sundays and public holidays) from North Point Ferry Piers and Causeway Bay (about 35 mins journey). Stanley Main Beach is situated about five minutes walk from Stanley Market on the opposite (eastern) side of the narrow head of the Stanley Peninsula. 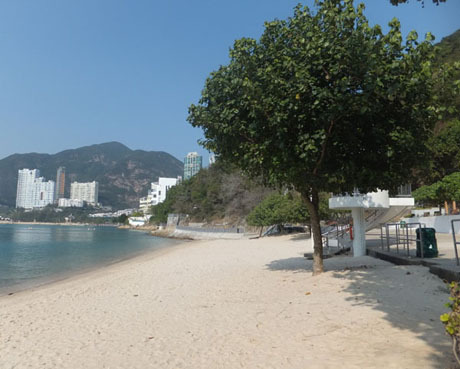 This is fairly narrow beach with reasonable quality sand and popular for water sports with a water sports centre and Hong Kong Sea School being situated at the southern end of the beach. The beach has good facilities with showers, changing rooms, toilets, food kiosk, toilets, raft, and is separated from the small neighbouring Hairpin Beach (showers and toilets but swimming not allowed) by a large BBQ area on a rocky headland. Lifeguard service operates from March to November and there are shark prevention nets. GETTING THERE- Bus 6,6A,6X or 260 from Central Exchange Square (about 50 mins journey). Bus 973 from Tsim Sha Tsui East Bus Station (Science Museum Road inside Concordia Plaza – about 90 mins journey). Bus 63 (Mon-Sat) or Bus 65 (Sundays and public holidays) from North Point Ferry Piers and Causeway Bay (about 55 mins journey). For more detailed information see “STANLEY”. Stanley’s “other beach” St Stephens Beach is about 15 minutes walk away from the central district on the western side of the peninsula on Wong Ma Kok Road near Stanley Military Cemetery. This is another popular beach with good clean sands shaded by trees and a little quieter, more secluded, picturesque and sheltered than Stanley Main Beach. This beach also has a water sports centre and pier and facilities include changing rooms, showers, toilets, raft, snack kiosk and BBQ area. Lifeguard service operates from April to October and there are shark prevention nets. GETTING THERE – See information above for getting to Stanley Main Beach. Stanley St Stephens Beach walk is about 15 minutes walk along Wong Ma Kok Road past St Stephens College. As an alternative to walking visitors can take number 14 bus (every 15/20 mins) from Stanley Village (about 3 minutes journey). Get off at Stanley Military Cemetery, cross the road and walk in either direction for steps or road down to beach. Secluded South Bay Beach, often almost deserted during daytime, has earned a reputation as a night time "party beach"
South Bay Beach is one of a string of beaches located on the south side of Hong Kong Island and although within walking distance of neighbouring Middle Beach and Repulse Bay it is not served by public transport. It is located in a secluded bay facing the Ocean Park headland and has a good sandy beach. It has a bathing shed and raft, BBQ facilities, changing rooms, showers and a fast food kiosk. Lifeguard service operates from April to October. During the daytime at least, the beach is usually quiet and often almost deserted. 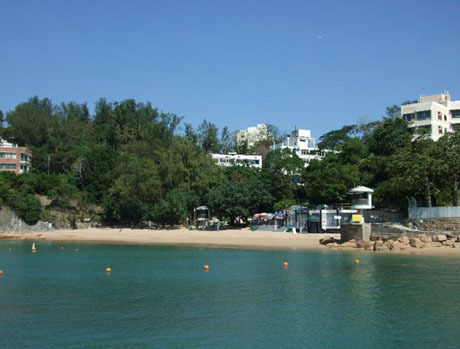 However, the rooftop South Bay Club, has, in recent years, helped the beach earn its reputation as a “party beach”, being particularly popular with Hong Kong’s trendy youth at night time. Following complaints about noise and accusations that the club operator has refused ordinary beachgoers access to seating, the government’s Leisure and Cultural Services Department (LCSD), which manages the beach has imposed opening restrictions and replace lounge chairs with standard LCSD fixed metal beach furniture from 2012. GETTING THERE – The beach is located at the end of South Bay Road, which is not served by public transport. However, it can be reached on foot by following South Bay Road from Repulse Bay via Middle Bay, a distance of about 1.4km, or by taking taxi from Repulse Bay (fare HK$20, about 5 mins journey). Repulse Bay can be reached by bus 6,6A,6X or 260 from Central Exchange Square (about 30 mins journey), bus 973 from Tsim Sha Tsui East Bus Station (Science Museum Road inside Concordia Plaza – about 70 mins journey) and bus 63 (Mon-Sat) or bus 65 (Sundays and public holidays) from North Point Ferry Piers and Causeway Bay (about 35 mins journey). 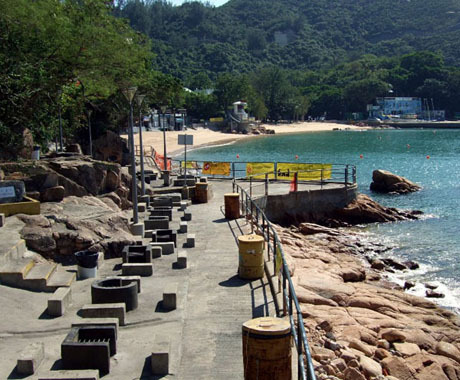 Middle Bay Beach, on the south coast of Hong Kong Island, is a short walk from neighbouring Repulse Bay Beach. 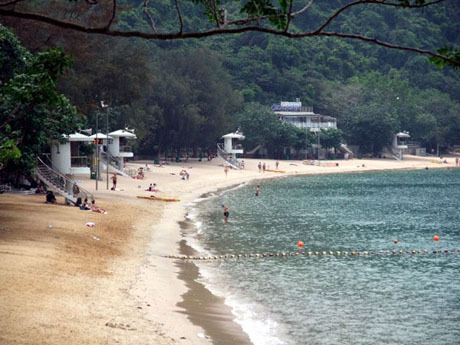 The beach faces the Ocean Park headland across the bay and is a small, secluded quiet beach with fine sands, fringed by trees offering a much more peaceful alternative to Repulse Bay Beach. The beach has good facilities including fast food kiosk, BBQ area, changing rooms, showers, bathing shed and raft. Lifeguard service operates from April to October. GETTING THERE - The beach is not directly served by public transport but is only about 15 minutes walk along South Bay Road from Repulse Bay. Repulse Bay can be reached by bus 6,6A,6X, or 260 from Central Exchange Square (about 30 mins journey), bus 973 from Tsim Sha Tsui East Bus Station (Science Museum Road inside Concordia Plaza – about 70 mins journey) bus 66 from Central Exchange Square (Mon-Fri peak hours only), bus 63 (Mon-Sat) or bus 65 (Sundays and public holidays) from North Point Ferry Piers and Causeway Bay (about 35 mins journey).